Happyland Figures / people, Great assortment, Pay 1 postage fee! New Ones added! ELC Happyland Figure Bundle. Condition is Used but veru good. Please see photos for general condition. Dispatched with Royal Mail 2nd Class. BUNDLE INCLUDES:-. 1 X PRE SCHOOL BUILDING. 4 SOUND BUTTONS THAT CAN BE PRESSED ON THE ROOF. DOUBLE OPENING DOORS TO THE FRONT AND SINGLE OPENING FRONT DOOR. OPEN PLAN STYLE INSIDE. 1 X PLASTIC TOY SELECTION BLOCK. Great Figure and Animals Bundle . Family is new but box is torn. Please see pics for details. Condition is Used. Dispatched with Royal Mail 2nd Class. Happy Land Village Vets, with figures, animals and car. Used but excellent condition. Dispatched with Royal Mail 2nd Class. ELC Happyland Rose Cottage with sounds, used but in excellent condition, all noises still working. Dispatched with Royal Mail 2nd Class. Happyland Camping Set Plus Stables & Figures. It is in good condition I have cleaned it but there are a few marks I could not remove which are shown in the photos and the stables only have one door.the camping stove makes noise and is working and will come with new batteries.many thanks for looking. Condition is Used. This chunky Country Train Set is perfect for little hands to enjoy. Your young child can enjoy stopping and starting the train, putting the passenger on and off, and working the level crossing. This is a Happyland Picnic set. All in good played with condition. 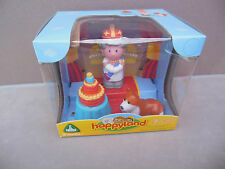 A nice little set which would make a great addition to any Happyland collection. Happyland Figures ELC Early Learning Centre Boy Girl Dog Cat Bus Conductor etc. BUS HAS ROOM FOR 11 PASSENGERS AND OF COURSE ROOM FOR THE DRIVER UP FRONT! IF YOU PREFER NOT TO HAVE NOISES THEY CAN BE SWITCHED OFF UNDERNEATH THE BUS. MINOR USAGE/SCUFF MARKS GENERALLY AS TO BE EXPECTED FROM PLAY. ALL IN NICE CLEAN CONDITION. EXCELLENT CONDITION. 1x *VGC* ~ ELC Happyland Royal Family ~ Roya Wedding and Royal Baby Playsets. Condition is Used. Dispatched with Royal Mail 2nd Class. ELC Happyland Family Play Set. Includes: 4 figures - Mum, Dad, son & daughter (pet cat is missing) In very good used condition, does have a few scuffs from play. From a smoke free and pet free home. Also selling other Happy land & toddler items, please take a look. Happy to combine postage costs for multiple purchases, please request an invoice before paying for multiple items. Dispatched with Royal Mail 2nd Class. ELC HAPPYLAND FIRE ENGINE PLAYSET. Features lights and different sounds when pressing the buttons at the front and on the sides. happy land boot. Condition is Used. Collection in person only. ELC Happyland Musical Fairground Bundle . Condition is Used. Dispatched with Royal Mail 2nd Class. Set includes small pirate ship, carousel with music, aeroplane ride, train and clown. All in excellent condition. ELC Happyland Tow Truck Playset Bundle Figures Car. A tow truck with a car and 2 figures. In good used condition. Please feel free to ask any questions. Collection welcome from Paignton TQ3 area. I am happy to combine shipping where possible. Please ask for a quote. From a smoke free and pet free home. Have a look at my other items for more great bargains. ELC Happyland Animals Figures Children Bundle Couple of the horses have pen on their backs Condition is Used. Dispatched with Royal Mail 2nd Class. MADE FROM STURDY PLASTIC WITH PRETEND THATCH STYLE ROOF AND FLOWERS GROWING UP THE FRONT WALLS. GOOD LUCK HORSE SHOE ABOVE THE FRONT DOOR. OPEN THE RED FRONT DOOR. BATTERIES REQUIRED FOR SOUNDS (NOT SUPPLIED). ELC Happyland Zoo Set Bundle with Enclosures, Animals, Figures & Train. In used but excellent condition. Will be posted by 2 day courier (Hermes) or can be collected by buyer. Happyland Bus And Figures. Condition is Used. Dispatched with Royal Mail 2nd Class. Rare (only one I could find on eBay at time of listing) ELC Happyland red town house with five family figures & green car. Working sounds and lights include door bell, television, bath filling up and toilet flushing. In played with condition, please see photos. Please note the front door is missing and the porch roof has been painted white (not by us!) and is starting to chip off. I'm selling other Happyland sets and am always happy to combine postage when possible. If you have any questions, please ask. Elc Happyland. This seems to happen with all Elc Happyland toys! Fire Station Bundle. Fabulous fire station with lovely detailing. Five different sounds! Fire Engine with extending,rotating & adjustable bucket. Elc Happyland Farm Bundle. Fabulous farm with two stables,tractor shed & hayloft. Tractor & Trailer. Five animals. reach you in a "ready to play with" condition. Excellent quality. This doesn't affect the fun! ELC Happyland Greengrocer with his stall of fruit and vegetables. Mixed lot elc happyland toys. see photo all working all farm building are in vgc. Happyland Space Bundle in good clean condition please see pics for details . Dispatched with Royal Mail 2nd Class. Large Happy Land Bundle. Condition is Used, but good condition. Collection only Peterborough! Elc Happyland faeries with Hedgehog.